Flavoured black tea. An exceptional blend of fine teas, enhanced with subtle Bergamot notes. Place one tea bag for each person in a cup or pot. Pour in fresh boiling water. Allow to infuse for 2-3 minutes. Add milk, sugar or honey as desired. 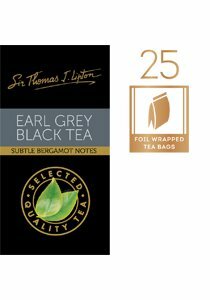 Weight - 50 g. Weight per serving/portion - 2 g.
100% Rainforest Alliance Certified Tea.